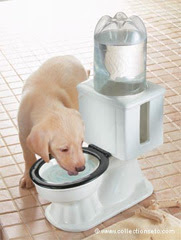 Does Your Doggie Drink From The Toilet? 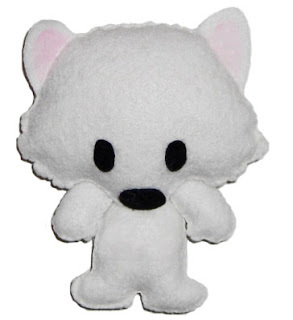 Look what my pals Snoopy and Snowball's Mommie got for them. It is so funny! I got another blood test on Monday. Both my PCV and platelets went down again. Sigh! But I am having lots of energy despite the drop so hopefully that means I will be ok. Thanks to all my wonderful friends who sent me loads of mail wishing me well. Here are the greeting cards I got. I sniffed them all real good. And I got another new toy in the mail! Oh boy! It talks ang wiggles. Mommie wanted to take a picture with me with all the mail but I got too tired. We went to church on Sunday so I got to hear mass. We sat outside on folding chairs and I got to see lots of people going in and out of the church. They have a tv outside and speakers so we could hear and see what was going on inside. I was well-behaved and was quiet and stayed in my spot. But eventually I got tired of sitting in my chair so Mommie let me lie down on the floor. Lots of people smiled at me and I smiled right back at them. It's fun to be outside. But Mommie did not let me near the grass coz she is afraid I might get fleas. My nosey is looking much better. The doctor said to put Vitamin E oil on it to help with the dryness. Most of the bristles have fallen off to reveal a nice smooth nosey underneath. It is still dry in some places though. I can't wait to get a healthy nose like other doggies. Hooray!!! My blood test yesterday shows my PCV is at 41!!! That is the highest I have gotten since I relapsed. And my platelets are high too at 562k. Whoopeee! This means Mommie will let me play more. The doc wants to see how I do without my Neoral. That means one less pill for me to take. Goodie! We go back again for another blood test in 2-3 weeks.